Gerber daisys are so beautiful and this Bat Mitzvah wrapper is just bursting with color. Our GERBER DAISY CANDY WRAPPER will add a bit of springtime to any party. These Bat Mitzvah favors are almost too pretty to eat! Order the WRAPPERS ONLY. We provide the SILVER FOIL underlay and PERSONALIZED WRAPPERS! *This is for the do-it-yourselfer. We do NOT provide the Hershey candy bars!! *Our wrapper/foil combo will fit 1.55 oz "Regular" Size Hershey's® bars! *Assembly is required by customer *To sum it up: YOU buy the chocolate bars, YOU wrap bar with silver foil provided then wrap with your adorable personalized wrapper. Order the fully WRAPPED CANDY BARS. We will do the work for you! 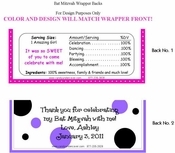 Your Bat Mitzvah Candy Bar Favors will arrive to you all ready to pass out to your guests. You will receive a PROOF of your wrapper prior to printing. Jumbo Wrappers Only $1.35 ea. Wrapped Hershey or Kit Kat Bars $1.85 ea. Belgian Chocolate Bars $2.00 ea. Please Note: You will enter quantity at check out page. You can add a photo to any wrapper. Please email your PHOTO to info@candyundercover.com.